When there are only two people living in the house, it can be difficult to eat up all the jams/jellies that get made throughout the canning season. Recipes often yield many pints and you never want to make just one kind of jelly. That means the pantry can quickly get overstocked with a variety of jams and jellies that don’t get eaten. It’s even worse when you don’t eat jam on toast or bread (I prefer my toast with lots of butter). As a result I’ve been trying to come up with creative ways to eat up some of the preserves in the pantry. Before our last trip, I remembered that I had some pastry crust in the fridge leftover from the video I made for Ethel. A perfect use for a jar or two of preserves. For these pies I used a jar of Caramelized Apple Marmalade with Thyme from Preserving the Taste and a jar of Meyer Lemon Marmalade as well. 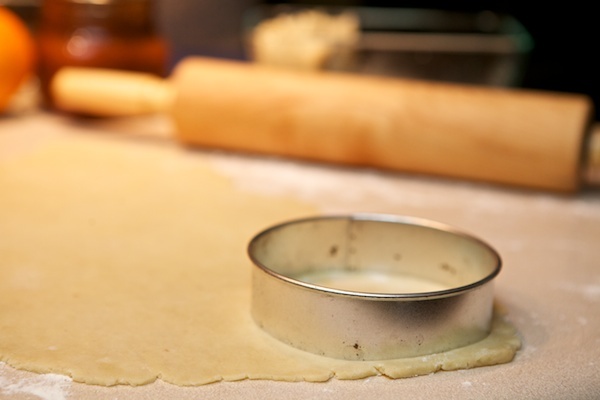 Roll pastry crust out to 1/8 inch thickness, cut circles from dough using cookie cutter. I used a 4 inch round cutter. 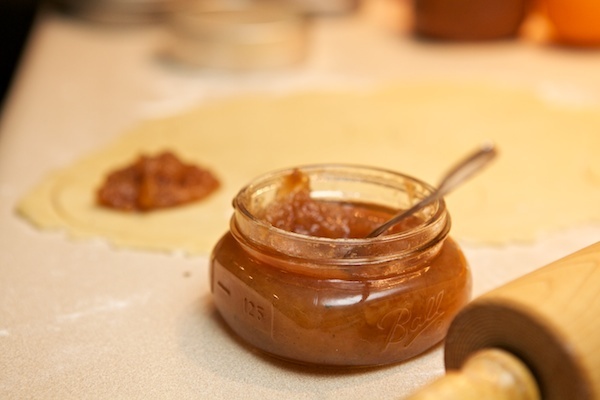 Put a small spoonful (about a Tablespoon) of jam, jelly or marmalade in the center of the circle. Brush a little cold water around the circumference of the dough using finger or pastry brush and fold it in half creating a semicircle. Seal using the back of the fork to make a decorative edge. Prick a few vent holes in the top of the pie (with care, you don’t want to smash them). 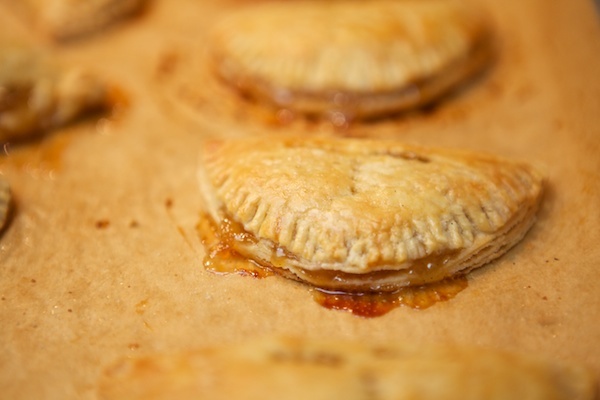 Place pies on unbleached parchment paper lined cookie sheet and brush with egg wash mixture. Sprinkle some coarse sugar on top. Continue making pies until you run out dough. 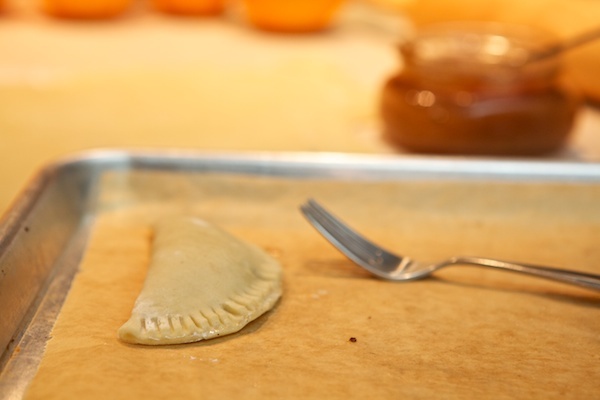 Bake until the hand pies are golden brown and slightly cracked, between 20-40 minutes. Remove the pies from the oven, cool slightly before serving. BEWARE: the marmalade in the pies will be very HOT – do not eat right away. These make the perfect finger snacks for parties – no dirty plates and forks to wash afterwards. They also make great on the go snacks keeping away those hunger pains so you don’t have to swing through the drive thru. The lard in the pie crust will help keep you full for quite a while. Can you think of a better way to use up some of those jars of jams/jellies in the pantry? What’s your favorite kind of preserve? Sounds good! My favorite preserve is strawberry. Ever since I started making it, I will never buy it again. Great idea Susy, I will definitely try this. I actually just made blackberry-black currant hand pies with an extra jar of jam the other day… Yummy and very wine-like. Preserves make excellent flavoring for plain yogurt. Make your own ‘fruit on the bottom’ (or top) yogurt without all the unpronounceable ingredients. My grandma always had apricot preserves too – they always remind me of her. The MiL makes these with green tomato mincemeat in them. Really good. I sometimes melt the jam or jelly with hot water and then mix it with seltzer to make a natural fruit soda. We also use it to flavor the plain yogurt I make. I’ve often thought about how to downsize my preserving efforts but can’t help myself and give lots of it away. The tastiest thing I’ve made this year has to be marmalade although I find it hard to pick a favourite as everyone seems special to me. In recent years I started making one or two batches of different preserves that way we don’t end up with too much in the pantry! MMM ginger, I think everything is better with ginger! I will gladly take any that you can’t eat off of our hands when you run out of ideas 🙂 LOVE THAT STUFF! !